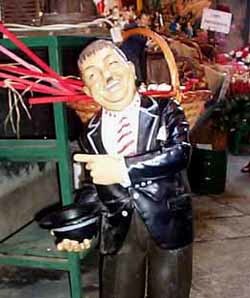 This model of Oliver Hardy is on via S. Gregorio Armeno. The Italian voice of Ollie was Alberto Sordi. It was a spectacularly successful example of dubbing. I was watching a skit with Neapolitan comic Massimo Troisi the other night on TV. Although I should know better, I was upset that I didn't understand the uncompromisingly authentic Neapolitan dialect. There were, however, subtitles to make the dialect intelligible to viewers from elsewhere in Italy who might be watching. For a long time, I had assumed that foreigners were the only ones who had such troubles. Not so. Italian dialects can vary considerably from standard Italian, so it is common to see such films with subtitles. Interestingly, that is about the only time in Italy that you see subtitles in films. Foreign films, unlike Italian dialect films, are always dubbed into Italian. Films are dubbed so well and so consistently in Italy, that it is common for a single dubber to shadow the career of a foreign actor for years. For example, with your back turned to the screen, even if the film is in Italian, you know that Woody Allen is speaking, because his dubber is always Italian comic Oreste Lionello. If Marlon Brando, Robert Redford and Paul Newman all sound the same in Italian, it's because the same dubber, Giuseppe Rinaldi, does all three of the voices. Emilio Cigoli does both John Wayne and Clark Gable, so you may actually have to turn around and look at the screen to find out if you're watching Stagecoach or Gone With the Wind. Dubbing a film is much more expensive than simply slapping subtitles at the bottom of the screen. Dubbing involves a sound studio, hiring voices for each character and doing take after take in an attempt to get the original inflections into a voice, and then making sure that the new language synchronizes as well as possible with the lip movements on the screen. Nothing is worse than bad dubbing, where the emotions of the voice don't fit the action, and where the synchronization is so out of whack that half the time the actors look like poor souls on street corners making silent fish-like mouth movements to themselves. Italian dubbing is generally so consistent that mimics regularly "do" foreign actors who have characteristic vocal styles—say, John Wayne or Jimmy Stewart. Such attention is paid to quality dubbing that Greta Garbo, for example, upon hearing herself in Italian for the first time, sat down and wrote a fan letter to her Italian voice, owned by actress Tina Latenzi. And some dubbing, of course, requires the same unusual verbal dexterity as the original voice —witness the tongue-twisting pyrotechnics of Stefano Sibaldi, the Italian voice of Danny Kaye. Perhaps the strangest sidelight in this whole matter is that dubbed voices can become part and parcel of another culture, evoking allusions and inside jokes just as do the original voices in their own culture. The Italian voices of Stan Laurel and Oliver Hardy are the best example of this. When talkies came in, Laurel and Hardy had already achieved world-wide fame on the basis of their short silent movies. There was such a new demand for them speaking, however, that for a time they actually reshot their scenes hurriedly in other languages, pronouncing their lines from scripts written in phonetic English. These scenes would then be sent abroad to be spliced into the rest of the film, which had been remade in the target language using local actors. That soon proved impractical, especially for longer feature films. Consequently, for the Italian market the decision was made to dub the films of Laurel and Hardy in American studios using Italian-American actors, who, presumably, thought they were speaking standard Italian. Their own Italian, however, had been maimed by at least one generation of nasal semi-vowels, unrolled r's and Wrigley's Spearmint. Anyway, gotta run. I hear the sultry, breathless tones of Rosetta Calavetta on the tube. Marilyn Monroe, to you.